Well, contrasting fortunes for Scotland's pro-teams. A big win for Glasgow over Munster - showing their attacking flair in the first half and their defensive snarl in the second, with the only minor disappointment the lack of a try bonus point. Still, two wins from two and nine points from a possible 10 for Dave Rennie's troops. Next up, South Africa, and away matches with the Cheetahs and Southern Kings. Edinburgh will be kicking themselves. For the second week running, they've ended up on the wrong side of an extremely tight match. This one, they led by 17 points heading into the final quarter. A little more precision, a little better discipline, and they'd have seen it out. Ulster scored some awesome tries and John Cooney - again - was their place-kicking match-winner. Richard Cockerill's side host Connacht in seven days time - join us again for that one. Thanks for your company tonight and enjoy your weekend! Richard Cockerill also told our reporter in Belfast that Mark Bennett has indeed suffered a hamstring injury, but that he doesn't yet know how severe it is. Richard Cockerill: "Ulster have the luxury, if they have injuries, they bring in Henry Speight, an international winger. We can't afford those things. "We did enough to win tonight. We've only ourselves to blame for not taking the points away. However, crikey, we played some good rugby tonight. If we can play at that level, especially away from home, we're going to cause teams problems. "Ulster will know they've got away with one - two weeks on the trot they've got away with one. Credit to Ulster, they came back and stuck at it. But credit to Edinburgh, their performance was outstanding. "We've got to learn to win those games - that's part of our development and it doesn't happen overnight." Edinburgh head coach Richard Cockerill: "It was a good game of rugby for both teams and we just fell the wrong side of the result. Last year we fell the right side of the result. Sometimes the game can be cruel. We've got to improve parts of our game to make sure we get across the finish line to win those games. "As a club we're improving. The guys put in a hell of a shift and played very, very well. You see from the reaction of the Ulster supporters and players - they're relieved and I think it's credit to Edinburgh and how the club's growing and the respect now have to put us in. "It's not a short fix and this is a step in the right direction although, crikey, it's a tough one to swallow at this point." Glasgow Warriors fly-half Adam Hastings on BBC Radio Scotland: "It was really good fun, lots of space out wide and in around the ruck as well. The whole game, the forwards stepped up amazingly and made our backs' job a lot easier. I think we were justified in giving Glasgow a hard time last year on their set-peice because they did struggle against the big teams in Europe. The way the game is, you just have to be physical. Teams took on Glasgow physcially because they felt it was an Achilles heel and they were found wanting. The players will be really wanting to make a mark this year. They've got to keep the guys fit and free of suspension. Nine points out of 10 from the first two games, you're buzzing. Two decent performances. This week, first-half they dominated, scored a couple of good tries. Second-half, their defence overall was good. It's the second game of the season so there's a lot of stuff still to work on but it's all about winning and getting momentum. They've got two weeks in South Africa now which will be tough, but if Rennie can come back with maybe three wins from four, they'll be pretty happy with their start. Glasgow Warriors head coach Dave Rennie on BBC Radio Scotland: "First half was excellent. We hung onto the ball, built a lot of pressure and benefited from that on the scoreboard. Edinburgh had chances in the second half but Ulster went the length of the pitch to score. If you can do that at this level you sometimes deserve to win. But the last two penalties - Edinburgh's one was really soft, the referee penalised Cooney for tackling Kennedy early. The last penalty, you just wonder if he was trying to level it up. He deemed the carrier was on his knees before the Edinburgh player stripped him. Edinburgh will be disappointed. They were well in front, playing pretty well and defending solidly. But Ulster have got so many classy players and they're at home. So, a blistering first-half display lays the platform for a second Glasgow victory in as many weekends. Dave Rennie and his players will probably be irked not to have scored the fourth try that would have bagged them a bonus point, but a solid win over Munster is not to be sniffed at. Glasgow's three tries came in the opening half, with Callum Gibbins racing in at the corner, Stuart Hogg grounding a brilliant Adam Hastings grubber-kick, and Adam Ashe pouncing on JJ Hanrahan's blunder. Munster dominated after the break, but Glasgow defended excellently until the end, when Rhys Marshall found his way through the home rearguard. Our man Thomas Duncan is hammering away at his keyboard to bring you the match report - we'll get you reaction from Rennie and perhaps a player or two when we have it. That's 35 points and two late, match-winning goals in two weeks for John Cooney. What a player he's been for Ulster. John Cooney is Ulster's hero yet again. He kicked them to victory against Scarlets last weekend and he's done the same tonight. Edinburgh and Richard Cockerill will be livid. They led by 17 points with 20 minutes to play and surrendered 24 points in the final quarter. John Cooney wins a pulsating game for Ulster! What a finish! The scrum-half's infringement looked to have lost his team the match, but he's stepped up and banged over a brilliant last-gasp penalty. Incredible finale. A total sickener for Edinburgh. John Cooney has a shot at redemption! Edinburgh penalised for not releasing the tackled player. It's just right of centre, 40m out, very similar to Hickey's strike moments ago. He's got it! Ulster win back the kick-off with the clock red and are attacking to try and salvage the game. What a finale!! 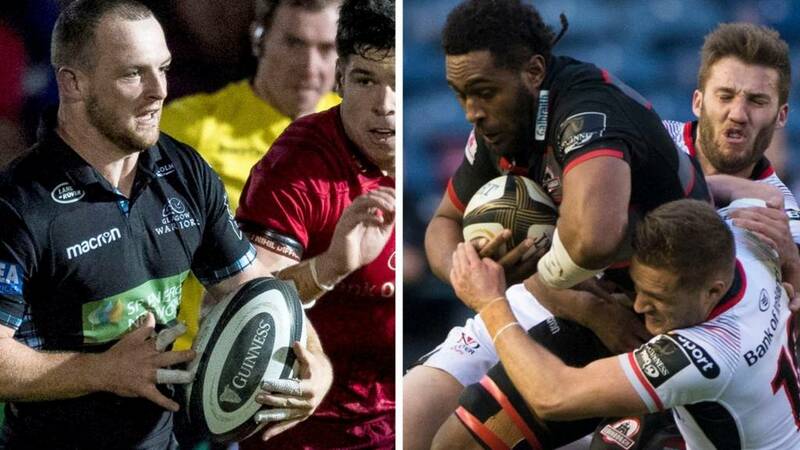 No bonus point for Glasgow, but an excellent display seals their second win in as many Pro14 outings. Edinburgh are trying to take Ulster on at the set-piece and milk a penalty. They've got all their front-row subs on, including Scotland's most capped player, Ross Ford. Three minutes left. Edinburgh scrum on the Ulster 10m line. What have they got? Callum Gibbins goes over, the Scotstoun crowd go bananas...but there was an earlier infringement and Munster have a penalty.